With respect to all references to persons used in these By-laws, the form of the reference selected shall apply to all genders. 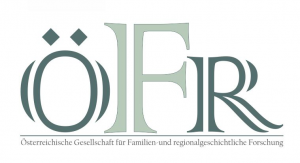 The name of the Association is “Österreichische Gesellschaft für Familien- und regionalgeschichtliche Forschung” (ÖFR, Austrian Society for Research on Genealogy and Regional Heritage). It is headquartered in Vienna, Austria and engages in activities all over the world. Carrying out research and participating in research projects. It is strictly non-profit oriented. The Association’s purpose shall be achieved on the basis of the non-material and material means as mentioned in Par. 2 and 3. 2.9. Setup of an analogue and/or digital library or a digital archive. 3.6. Income from requisite auxiliary operations. Full members shall be those who are fully involved in the activities of the Association. Associate members shall be those who mainly support the activities of the Association by paying a higher membership fee. Associate members shall not have the passive right to vote. Honorary members shall be those who have been nominated as such for outstanding services to the Association. Honorary members shall have the same rights and duties as full members. They can however be exempted from entrance and membership fees and do not have the passive right to vote. Entrance and membership fees shall be set by the Executive Board and confirmed by the General Assembly. They may be reduced for particular groups of members. Full and associate membership in the Association can be obtained by natural or legal persons, whether public or private. The Executive Board shall decide on accepting full and associate members. Acceptance can be declined without having to provide any reasons. The General Assembly shall take decisions on accepting honorary members. Prior to the foundation of the Association, preliminary acceptance of full and associate members shall be carried out by the founders of the Association, or by the Executive Board, on condition that it has already been appointed. Membership shall begin with the foundation of the Association. If the Executive Board is appointed after the foundation of the Association, the (definitive) acceptance of full and associate members shall also be carried out by the founders of the Association until then. Only natural persons can become honorary members. The nomination of honorary members shall be decided by the General Assembly based on a proposal by the Executive Board. Membership shall expire upon death, in the case of legal entities and partnerships with legal personality upon the loss of legal entity, through voluntary withdrawal or expulsion. Voluntary withdrawal of membership can be declared at any time. It must be communicated to the Executive Board in writing with a notice period of at least one month. The date of the postmark is decisive with regard to legal validity. In the case of late notification, membership shall end on the following termination date. The Executive Board can expel a member if, despite two written notices with an announcement of a suitably extended deadline, the member is more than six months behind in paying the membership fees. The obligation to pay outstanding membership fees shall remain unaffected. The Executive Board can also expel a member from the Association as a consequence of a serious breach of other member duties or of disreputable or judicially punishable acts. Honorary membership can be revoked by the General Assembly for the reasons stipulated in Par. 4. Members are entitled to participate in all events of the Association. The right to vote in the General Assembly as well as the active right to vote is open to all full and honorary members, the passive right to vote only to full members. Legal persons are represented by an authorised natural person who has one vote. Every member has one vote. Delegating the right to vote to another member by way of written authorisation is not allowed. The members are obliged to facilitate the interests of the Association to the best of their abilities and to refrain from any actions which would damage the reputation or the purpose of the Association. They must adhere to these By-laws and to the resolutions of the Association’s bodies. Full and associate members are obliged to pay the entrance and membership fees in a timely manner and at the level set by the General Assembly. The Executive Board shall forward a copy of these By-laws to any member upon request. Members shall also have access to the By-laws via the Association’s website. To request a General Assembly from the Executive Board, a minimum of one tenth of all members of the Association is required. At every General Assembly, the Executive Board shall inform the members of the Association of its activities and the financial situation of the Association. If at least one tenth of all members of the Association request so by specifying their reasons, the Executive Board has to provide the respective members with this information within a period of four weeks. The Executive Board shall inform the members of the Association of the audited clearance of accounts (financial statement). If this information is given in the course of the General Assembly, the Auditors shall be present and included. Written communication to the members of the Association is generally effected via email. The General Assembly is the “member’s assembly” in the sense of the Austrian law on associations. An Ordinary General Assembly is taking place at least every three years. 3.5. A resolution by a legally appointed trustee (Art. 11 Par. 2, last sentence in these By-laws) within four weeks. Petitions to the General Assembly must be submitted to the Executive Board at least seven days prior to the General Assembly in writing or by email. Nominations to the Executive Board must be supported by 10 % of all members of the Association unless they are submitted by the Executive Board. Nominations must be submitted to the Executive Board at least seven days prior to the General Assembly in writing or by email. Valid resolutions – except for those concerning a request to call an Extraordinary General Assembly – can only be passed with regard to the Agenda. All members have the right to attend the General Assembly. The right to vote is limited to full members and honorary members. Every member has one vote. Delegating the right to vote to another member by way of written authorisation is not allowed. The General Assembly shall constitute a valid quorum regardless of the number of members present. In the General Assembly, elections and resolutions shall generally take place by the ruling of a simple majority of the delivered valid votes. Resolutions that would alter the By-laws or dissolve the Association shall require a qualified majority of two thirds of the delivered valid votes. The President shall act as the chairperson at the General Assembly; in his or her incapacity, the Vice President eldest by years and present. Should all Vice Presidents equally be unavailable, the member of the Executive Board eldest by years and present shall act as the chairperson. The chairperson can hand over chairmanship to any other member of the Executive Board of his or her choice at any time without having to provide any reasons. If the General Assembly has been initiated by the Auditors, one of the Auditors shall act as chairperson at the start of the General Assembly. Consultation of and resolution on any other issues on the Agenda. The Executive Board shall be composed of the President, up to three Vice Presidents, the Managing Director, the Treasurer and a number of Consultants with specific fields of activity to be determined by the General Assembly.In addition, deputies can be elected for the Managing Director, the Treasurer, the Secretary and Consultants to be determined. Should a member of the Executive Board resign, the Executive Board shall have the right to co-opt a successor. In addition, the Executive Board may co-opt additional members without the right to vote at any time. All members of the Executive Board shall act in an honorary capacity, with the exception of the General Manager who may be employed if necessary. Other than that, cost compensations for the members of the Executive Board shall be possible. The Executive Board shall be elected by the General Assembly. Upon the resignation of an elected member of the Executive Board, the Executive Board shall have the right to co-opt another member. Subsequent approval shall be secured at the next General Assembly. Should the Executive Board in general fail to be available at all or for an unforeseeably longer period of time without supplemental co-option, every single Auditor is obligated to immediately call for an Extraordinary General Assembly with the purpose of electing a new Executive Board. The term of the Executive Board shall be three years. In any case, the Executive Board shall last until the election of a new Executive Board. Former members of the Executive Board may be re-elected. Every role within the Executive Board has to be executed personally. The Executive Board shall be convened by the President in written or oral form; in his or her incapacity, by one of the President’s deputies. Should they also be incapacitated for an unforeseeably longer period of time, every other member of the Executive Board may convene the Executive Board. In agreement with the President or a Vice President, the General Manager shall also have the right to convene the Executive Board. The Executive Board shall have a quorum when all members have been invited and at least half of them are present. The Executive Board shall pass resolutions with a simple majority; in the case of a tie, the President’s vote shall decide. The President shall act as chairperson, in his or her incapacity one of the President’s deputies. Should they also be incapacitated, the chairperson shall be the member of the Executive Board present and eldest by years or any other member of the Executive Board nominated by the majority of the members of the Executive Board present. The chairperson can hand over chairmanship to any other member of the Executive Board of his or her choice at any time without having to provide any reasons. Resolutions on individual and urgent matters may be passed by the Executive Board in the form of a written (email) circular resolution. Apart from death or expiry of the term of office (Par. 3), the term of a member of the Executive Board is terminated through dismissal (Par. 10) or resignation (Par. 11). The General Assembly can at any time dismiss the entire Executive Board or any individual members thereof. The dismissal of an individual member has immediate effect; dismissal of the entire Executive Board takes effect with the election of a new Executive Board. Board members may at any time announce their resignation in writing. The resignation letter shall be addressed to the Executive Board; if all members of the Executive Board resign, the letter is to be addressed to the General Assembly. Resignation only takes effect with the election or co-option (Par. 2) of a replacement. The Executive Board can delegate the acceptance of members to a committee composed of the President, the General Manager and the Treasurer or their deputies. The Executive Board shall be responsible for managing the Association. It shall be in charge of all duties which are not assigned to another representative body in the By-laws, as well as for those duties which arise for the managing body from the Austrian law on associations 2002. Hiring and laying off employees of the Association. All other aspects of general management, in particular drawing up the Rules of Procedure. Furthermore all members of the Executive Board are obliged to actively promote and support the intentions and objectives laid down in the purpose of the Association to the best of their ability. The President shall conduct the day-to-day business of the Association. The General Manager shall support the President in the administration of the Association’s business in accordance with the Rules of Procedure valid at the time. The President shall represent the Association to the public. Written and legally binding notices of the Association require the signature of the President or the General Manager to be valid, in financial matters (disposition of assets) the signature of the Treasurer upon prior verifiable authorisation by the President or the General Manager. Legal transactions between a member of the Executive Board and the Executive Board itself require the consent of another member of the Executive Board. Authorisations for legal acts to represent the Association to the public or to sign for it can only be granted to the members of the Executive Board listed in Par. 2. In the case of imminent danger, the President is authorised to take unilateral decisions on his or her own responsibility, even in matters that fall within the responsibility of the General Assembly or the Executive Board. Within the Association, these decisions require the subsequent approval of the respective representative body. The President shall act as the chairperson at the General Assembly and the Executive Board. The President shall instruct a member of the Executive Board with the keeping of the minutes of the General Assembly and of meetings of the Executive Board; the General Manager shall support the President in conducting the day-to-day business of the Association. The Treasurer shall be responsible for the orderly financial conduct of the Association. If unable to be present, the President, the General Manager and the Treasurer shall be represented by their deputies. The two Auditors shall be elected by the General Assembly for the duration of the term of the Executive Board. The Auditors must not belong to any representative body – with the exception of the General Assembly – whose activity is subject to auditing. Re-election is possible. If an appointment becomes necessary before the next General Assembly, the Executive Board may choose and appoint the Auditors. Auditors must be natural persons, they are not obliged to be members of the Association. They must however be truly independent and unbiased. In all other respects, the same regulations apply as those regarding the appointment, the dismissal and the resignation of the Executive Board (Art. 11 Par. 3, 9, 10 and 11). 3.1. The continuous control of business activities as well as the auditing of the financial activities of the Association with regard to the correctness of the financial reporting and the statutory allocation of means. The Executive Board shall provide the Auditors with the necessary documentation and information. The Auditors shall inform the Executive Board about the results of their audit. 3.2. The immediate communication of the auditing report to the Executive Board as well as the participation in the Executive Board’s report to the General Assembly. Legal transactions between the Auditors and the Executive Board itself require the authorisation of the General Assembly. In all other respects, the same regulations apply to the Auditors as those stipulated in Art. 11 Par. 8 – 10. The Board of Arbitration shall decide in all disputes over matters arising within the Association. It is an “arbitration panel” in the sense of the Austrian law on associations 2002 and not a “court of arbitration” according to Par. 577 ff ZPO. The Board of Arbitration shall consist of three full members of the Association. It shall be chosen in the way that one party for arbitration is naming a member of the Board of Arbitration in writing to the Executive Board. Upon the request of the Executive Board within a period of seven days, the other party for arbitration is in turn naming a member of the Board of Arbitration within a period of 14 days. Upon information by the Executive Board within a period of seven days, the nominated Arbitrators elect a third full member to be the chairperson of the Board of Arbitration within a period of 14 days. In the event of a tie, the election shall be settled by drawing a lot from among the nominated members. The members of the Board of Arbitration must not belong to any representative body – with the exception of the General Assembly – whose activity is subject to arbitration. The Board of Arbitration shall render its decision after listening to both parties of arbitration by a simple majority of the votes with all of its members present. It shall decide to the best of its knowledge and belief. Its decisions are binding within the Association. An Advisory Board shall support the Executive Board in scientific questions. Acceptance of members of the Advisory Board is enacted by a simple resolution of the Executive Board. Membership in the Advisory Board is not linked to membership in the Association. The term of the Advisory Board shall end three weeks after the election of a new Executive Board unless the newly elected Executive Board adopts the resolution to renew the term of the members of the Advisory Board. The members of the Advisory Board are not members of the Executive Board. Meetings of the Advisory Board shall take place as required and be convened by the President. The voluntary dissolution of the Association can only be resolved in a General Assembly convened for that purpose and with a majority of two thirds of the delivered valid vote. Should the Association have assets, this General Assembly shall also decide their liquidation. Specifically, the General Assembly shall appoint a liquidator and pass a resolution on the beneficiary of the remaining assets of the Association once the liabilities have been settled. At the dissolution of the Association or the discontinuation of the aforementioned privileged purpose of the Association, the remaining assets of the Association shall be employed for non-profitable, charitable or ecclesiastical purposes within the meaning of Art. 34ff BAO. Should there be no resolution on the beneficiary of the remaining assets of the Association, the assets shall go to the Archives of the Archdiocese of Vienna.